This surname is of Yorkshire, West Riding, origins. It derives from the two places called either Hardisty in Nesfield, near Ilkley, or Hardisty Hill near Fewston, in the same area. The origination is Norse Viking and the hamlets names mean "The sty of Hardolf." The word "sty"` had a completely different meaning to today (20th century). Now it describes a small building in which an unfortunate pig is kept, then in the 9th Century it described a farm of some size. "Hardolf" is made up of two compounds - "hard" which describes somebody who was hard and brave, and "ulf" - a wolf. The Norse- Vikings loved names which reflected their attitudes, and this is a good example. The name is first recorded in the 14th century (see below) and a Coat of Arms was also granted to the Yorkshire family, being a blue field charged with a lion rampant between three fleur de lis, this blazon implying victory over the French. Examples of the surname recording include William Hardosty in the York Rolls of 1450, whilst in the church registers An Hardisty married William Sligsby at Fewston Church on February 1st 1600 in the reign of Queen Elizabeth 1 (1558 - 1603). Amongst the early settlers to New England in 1635 was one John Hardisse, as recorded. 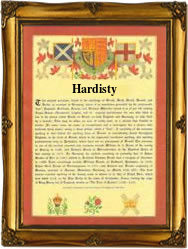 It is possible that he was originally a "Hardisty" who fell foul of 17th century spelling. The first recorded spelling of the family name is shown to be that of John de Hardolssty, which was dated 1379, The Friary & Poll Tax Rolls of Yorkshire, during the reign of King Richard 11, known as "Richard of Bordeaux" 1377 - 1399. Surnames became necessary when governments introduced personal taxation. In England this was known as Poll Tax. Throughout the centuries, surnames in every country have continued to "develop" often leading to astonishing variants of the original spelling.